1. Scale: Balance oversized furnishings or accessories, and keep the number of pieces to a minimum for an uncluttered look. 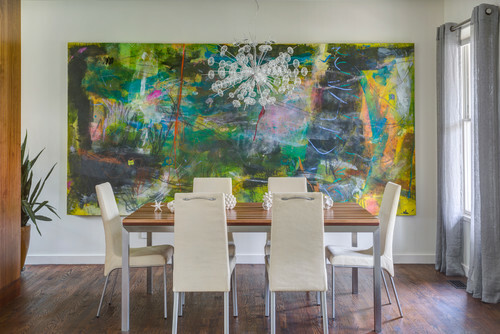 In the picture below, a painting dramatically takes over nearly the entire wall. 2. Accent with colour: Play with colour in your accessories, for example, imagine chartreuse pillows in a monochromatic space. 3. Don’t match: You don’t need to have a matching set. For example, a dining table and an unmatched set of chairs show more personality and style. 4. Mix it up: Pull together antique, vintage and modern furniture to make the space feel lively. In the photo below, Victorian style furniture is dressed in modern fabric and the wooden frames are painted in shiny black. 5. 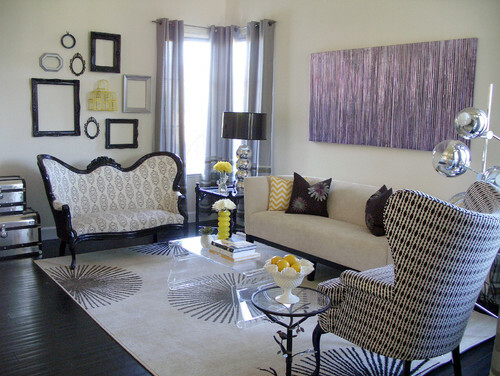 Juxtapose: Try playing with opposites in a room, like formal versus informal. 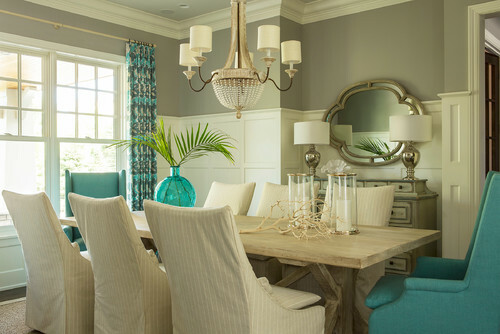 In the photo below, a formal chandelier and mirror are combined with slip cover dining chairs.